Medicated Body Powder's triple action formula is a blend of two medically proven ingredients combined with the finest powder and essential oils. The unique formula works hard to cool and soothe skin while absorbing excess moisture and stopping the itch. Medicated Body Powder is medicated to work hard, yet gentle enough to be used every day. Clotrimazole topical is an antifungal antibiotic that fights infections caused by fungus. Clotrimazole topical is used to treat skin infections such as athlete's foot, jock itch, ringworm, and yeast infections. Treating athlete's foot, jock itch, or ringworm and relieving the itching, scaling, burning, and discomfort due to those conditions. It may also be used for other conditions as determined by your doctor. Micatin cream is an antifungal. It works by weakening the fungal cell membrane, which kills the fungus. Treating certain fungal infections such as athlete's foot, jock itch, and ringworm. It may also be used for other conditions as determined by your doctor. Tolnaftate powder is an antifungal. It works by blocking the growth of fungi that cause skin infections. 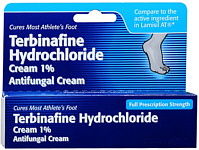 Prescription strength Terbinafine 1% Athlete's Foot Cream is an OTC antifungal cream proven to cure most athlete's foot. The athlete's foot cream relieves the main symptoms of athlete's foot such as itching, burning, cracking and scaling.